Today marks the second installment of our new Packaging the Future series, which explores a greener future for packaging design, brought to you by Eco Chick founder and green journalist Starre Vartan! It's always bothered me that deli containers, take-out boxes, and other one-time-use packages sit in landfills for thousands of years after we've used them for all of an hour, or tops, a few days. I avoid as much unnecessary packaging as I can, but it's not always possible or likely that we can bring our own reusable containers to fill, especially if we make an unanticipated trip to the grocery store or stop in for a meal on the go. 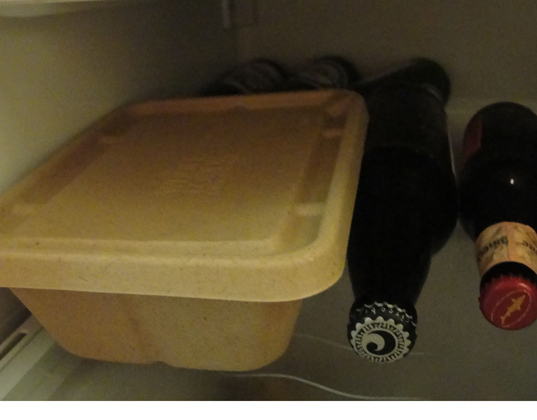 Biodegradable or compostable containers seem like a great solution: they give us convenience while minimizing waste -- but do they actually work in real life? 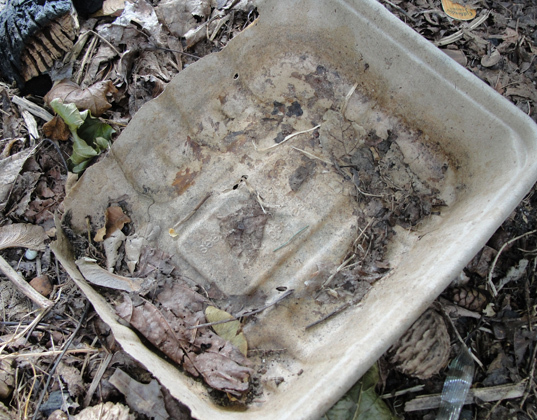 Read on for our hands-on test of compostable containers! Because I’ve heard mixed messages about the compostability of packaging labelled biodegradable, I figured the only way to figure out what works and what doesn’t is to stop listening to rumors and try them out myself. My first experiment was with a Whole Foods deli container, simply because it was at hand; I shop at the supermarket in both Manhattan and in Darien, CT where the chain has recently opened its newest store. In an ideal world, I would make my own pasta, bean and whole grain salads every Sunday and store them in reusable containers for the week. In reality, I’m not the world’s most enthusiastic cook and I regularly buy the salad-bar concoctions so that I have healthy, fresh food when I come home hungry at 9pm at night. After a rain shower and a couple of days in my compost, the box started to collapse. Whole Foods’ deli packages, available at all their stores, did really well in my test, breaking down in about a month in my backyard compost bin. Disclaimer: I’m not a really dedicated composter (some people get science-y and keep track of oxygen and nitrogen levels and keep their composts at optimum temps for biodegradability.) I just throw my scraps on top, mix them around with some dead leaves and let nature run her course, which means mine is not a perfect system and doesn’t break stuff down as fast as a well-managed bin could turn organic matter to soil. But I get great compost from it each spring for my garden, and I keep some garbage out of the landfill, which works for me. Eight days in, the box was breaking down. Ashley Hawkins, of Whole Foods Market, told me that the boxes are made from a mixture of natural fibers grown annually, including sugar cane pulp (bagasse), corn starch, cattails (bulrush), asparagus, tapioca root, and bamboo. ‘[The box] can also be easily integrated into our store compost and food waste collection programs,” said Ashley. 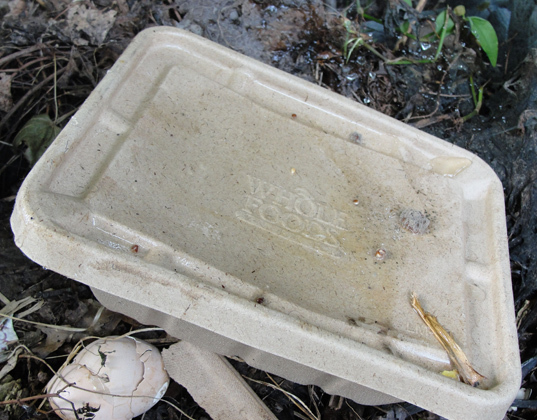 After noticing how well and quickly the box broke down in my backyard bin, I wasn’t surprised when Ashley also told me that Whole Foods tested the compostability of the packages themselves, in various locations (the dry and less-rainy Cali climate is very different from the hot, humid and rainy weather I get in Connecticut, yet good biodegradability needs to occur in both locations for a successful product). 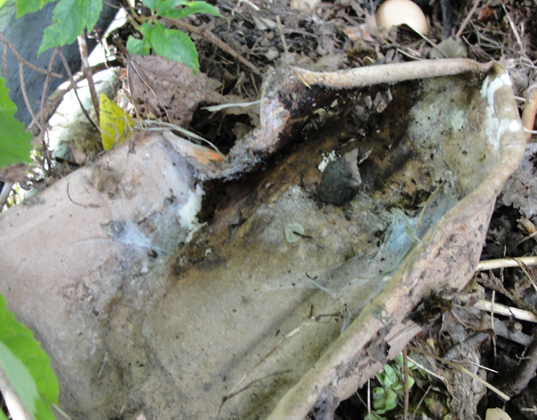 Three weeks into an admittedly hot and wet summer (which aids biodegradability), the box was almost unrecognizable. Ashley told me that she is not at liberty to detail the cost of the containers or the company that makes them. I’d really love to know how much more they cost vs. the traditional plastic ‘clamshells’ one normally finds at salad bars. It would also be worth doing a cost/benefit analysis of the energy needed to create the natural fiber box versus a plastic one. They are testing out these containers in the meat department of some of their markets and may use them in other applications in the future. At least one hurdle has been jumped; these containers are proof that we can have real-life compostability and keep food fresh and leak-free. Starre, I found your article online. I work for Be Green Packaging, the company that manufactures these containers. We manufacture well-designed, high quality, industrial and food-grade, tree-free, GMO free, compostable packaging. Our products can be found in various departments of Whole Foods Markets such as deli (sushi), meat, poulty, retail, and the salad bar. Our products are easy to recognize on the shelf as they are all the same natural brown color as the one's you used for your composting experiment. We try to be price neutral with plastic and polystyrene products. 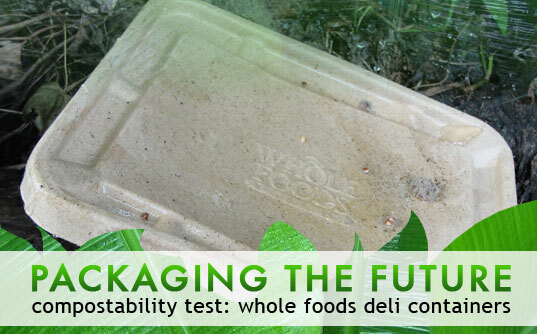 We appreciate you taking the time to test the compostability of our products and write about them! We would also like to let you know that Ashley from Whole Foods Market must have been misinformed. Our products do not contain bagasse, corn starch, tapioca root, or asaparagus! They do contain bulrush and bamboo however. Our mission is on par with yours and we hope to help rid the packaging industry of single use, non-renewable (petroleum) based, non-recyclable and non-compostable containers. For more information about Be Green Packaging LLC, please visit our website at: www.begreenpackaging.com You can also email us at: [email protected] Thanks again for your interest and enthusiasm for compostable packaging! Plastic is less expensive. And recyclable. Molded fiber (bagasse, bamboo, rice husk, etc.) is bidegradable & compostable...but not necessarily recyclable. However, exposure to sunlight, moisture, and soil will rapidly convert these containers into humus. It\'s good stuff! But made in China. There's def a difference between a hot compost, or a commercial composting facility and what happens in the random backyard composting bin (especially mine! which is a bit haphazard). In my mind, all packages should eventually break down even without commercial composting since there's so much litter (which would be reduced if it broke down naturally) and would also solve the problem of the Garbage Gyres- if packaging biodegraded it wouldn't be choking the ocean and our waterways as it does now. Cool test- I tried the same with the Sun Chips 'compostable' bag in my heap for weeks but without similar results. It still looked like a chip bag with out being in a hot compost bin. great! i can feel less guilty about going there for meals, instead of cooking at home! Always wanted to know about this - thank you! I kept my Whole Foods deli box in my fridge for five days. It was filled with rolled grape leaves (oily) and quinoa salad (somewhat watery). It kept the food fresh as Tupperware would, sans leaks. Carrying my used deli container to my backyard compost bin, instead of tossing it in the trash.